Home › Dog training › Dogs learn best with treats. What about horses? Most dog trainers today understand the value of using treats. Dogs are more focused, learn faster, are more motivated and the results speak for themselves. If personal experience isn’t enough, a recent study even confirmed that dogs worked better for food rewards over praise or petting (Fukusawa & Hayashi, 2012). In the horse world, there is still a lot of resistance to the idea of using treats, but science today may help us make the right decision when working with these animals. Just like dogs, horses work best for treats. If we’re working with horses or trying to strengthen our relationship with our horse, it’s time to bring out those carrots! I’ve been around horses all my life and have witness the gradual changes from forceful and brutal training to ‘natural horsemanship’ techniques. Buck Brannaman, Monty Roberts, Pat Parelli and other horse whisperers have taught us different ways with horses and have contributed to teaching us more effective and humane methods to interact with them. We’ve become better at paying attention to their emotional reactions and understand when they’re afraid, interested or confused. Yet, some of the principles are based on subjective interpretation and very few ever emphasize the value of using treats. Alexandra Kurland has promoted the use of clicker training with horses and change is slowly happening, but the resistance to using food rewards is still strong in the horse world. I had a horse called Sissy. She was a half Arabian pinto and wore her name very well. When I first got her, I couldn’t brush her, saddle her or even walk towards her left side without triggering overt signs of anxiety. I spent hours applying techniques I had learned from Parelli, Lyons and other great horse trainers, hoping to help her build more confidence in people. My goal was to develop a relationship with Sissy, a bond based on trust and understanding. I spent a full year working on the ground with her, before I could ever ride her. What I learned during that time was invaluable and contributed greatly to my understanding of fear in animals. After all, what better animal to learn from, than a prey animal that is always on the lookout for potential danger. My own safety depended on my ability to teach her to relax, and I was not interested in getting injured. I’m forever grateful to the teachings that I learned over the years as my relationship with her went beyond what I ever expected with a horse. Not only could I ride her, she was also willing and clearly enjoying our time together. I don’t agree with all of their philosophy and methods, but I learned valuable lessons from natural horsemanship. The real breakthrough however, came when I started using treats! Sissy lit up, was interested, offered behaviors, tried harder and learned faster. Her problem solving skills and intelligence was obvious and absolutely mesmerizing to me. Small pieces of apples and carrots became my best ally when saddling her, asking for her feet, teaching her new behaviors, bow or circle around a barrel. I used treats working on the ground or in the saddle, sometimes with the clicker, sometimes without it. Training was fun and exciting for both of us and just like with dogs, treats were easy to use and could gradually be faded out or replaced with other forms of reward. One would think that watching a horse and her owner have fun together and have results far beyond what most owners ever achieve would be inspiring or at the very least intriguing. Not at all! For many of the other riders boarding their horses in the same facility, I was bribing my horse. Food rewards are taboo in the horse world and a definite no-no. Giving an apple or carrot to a horse is fine, just not during training sessions. I was looked down upon by most and often overheard their disapproving comments. One of the biggest concerns: horses will become beggars and will constantly be looking for food, searching in our pockets and hands. But just like dogs, horses do what works and are capable of learning that those behaviors simply don’t pay off. I stumbled across a new blog from Companion Animal Psychology about a French group of scientists who decided to investigate whether horses, like dogs, also preferred food rewards over ‘grooming rewards’ (scratching on the withers) (Sankey & al., 2010). When animals bond, and form relationships with one another, physical contact is an important element of their interactions. But of all social behaviors, food sharing plays a critical role in the development of those relationships. Across species, the bond between a mother and her child is the strongest. Caring and feeding contribute in a big way to keeping that bond strong. It only makes sense, that because we’re their source of food, our animals develop deep emotional attachment to us. Using food during training would therefore contribute to that bond no matter what animal we work with, including horses. Figure 1. Latency to approach the experimenter and time spent near her (distance <0.5 m) in the “motionless person test” by food-rewarded and grooming-rewarded horses, before and after training. As much as we love the idea that animals like to be touched, petted and hugged by us, the truth is, many either have a moderate taste for physical contact or simply just put up with it. The appreciation for human contact probably varies from one animal to another and may grow as the relationship deepens. Though I believe that animals can develop a real taste for human touch, like some cats that demonstrate rather clearly how much they enjoy them, we cannot assume that our affectionate displays are always appreciated. Food on the other hand, has intrinsic value no matter what species. Food has proven to not only shorten training time, but also to contribute to the animal/human bond. When we’re looking for better and faster results but also to develop a bond with an animal, food definitely stands out over other forms of reward. ‹ What happens to fear if left untreated? 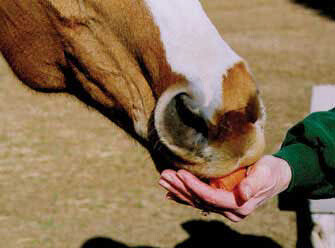 Have been clicker-training horses with treats for years now – love your article! Love this article. I am one that came up through the Parelli training system for my horse, but have been looking to incorporate clicker-food-based training in to what I learned from natural horsemanship. One question – do you still get the licking and chewing? Is it important, or is chewing up the reward food just as good? When clicking and treating, just eating the treats is fine. I wish you lots of fun with your horse! Thank you for such a wonderful article. The treats worked great in training my horse. Yes indeed treats do work well on dogs (well most of breeds) but as for horses I don’t know. I have seen many of horses that treats did not work on them. Current studies do confirm that treats work well for training horse as well. In fact, as with dogs, work better than force-based training methods. And as a horse owner and trainer I can confirm those findings. How you use the treats makes all the difference. Luring doesn’t work well with horses. Operant learning does.